Hey there…we are so excited to see you here today! 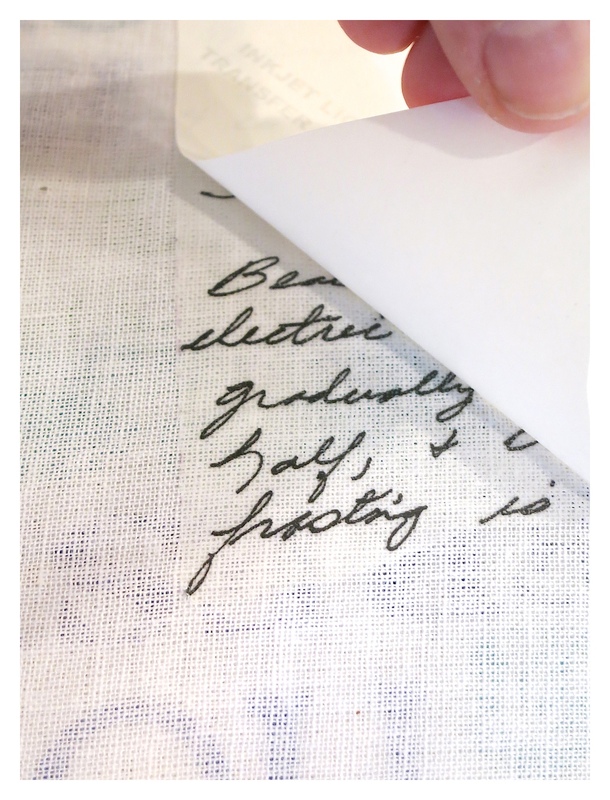 As promised, we are going to show you how we created our DIY Handwritten Recipe Tea Towels. Yesterday we participated in a Family Recipe Swap with four other bloggers. 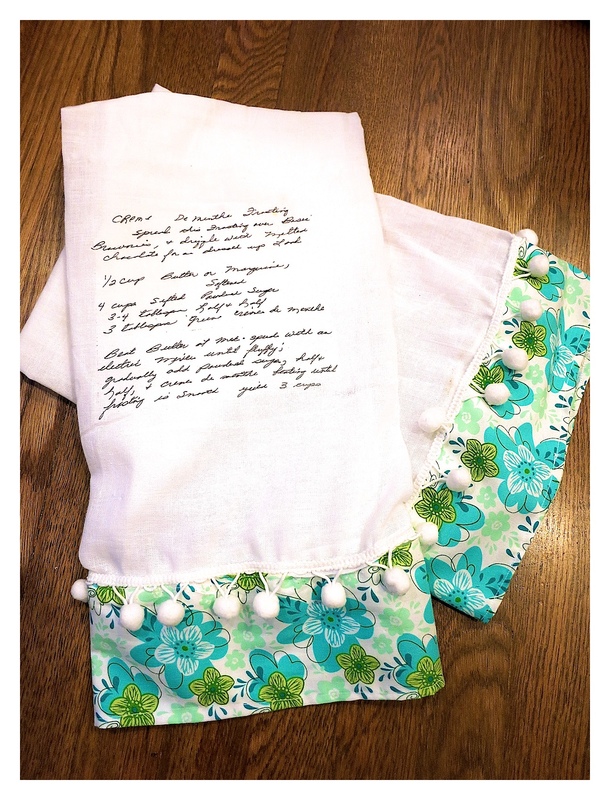 We commemorated our day of celebrating my mom – Jennifer’s Granny – by creating pretty tea towels. 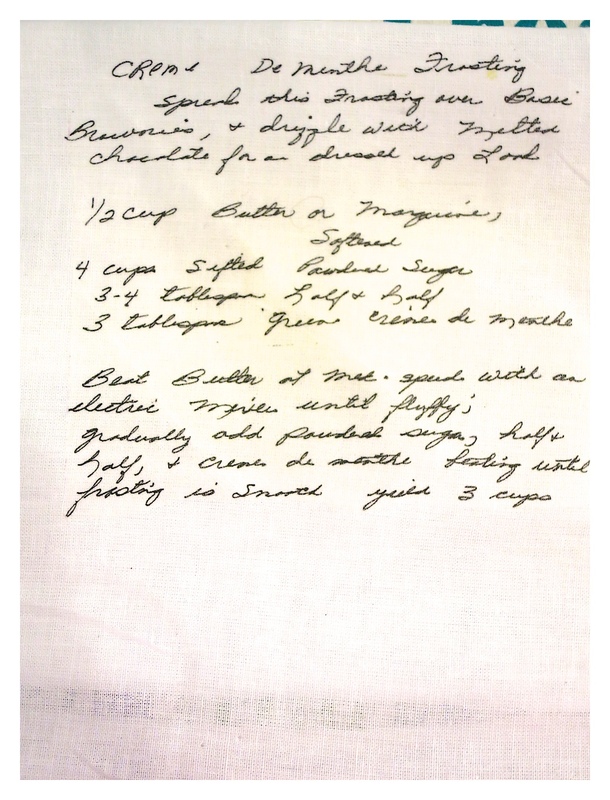 The tea towels are printed with Barbara Jean’s recipe in her handwriting. These tea towels will make great gifts for Mother’s Day, Birthday’s or any celebration! 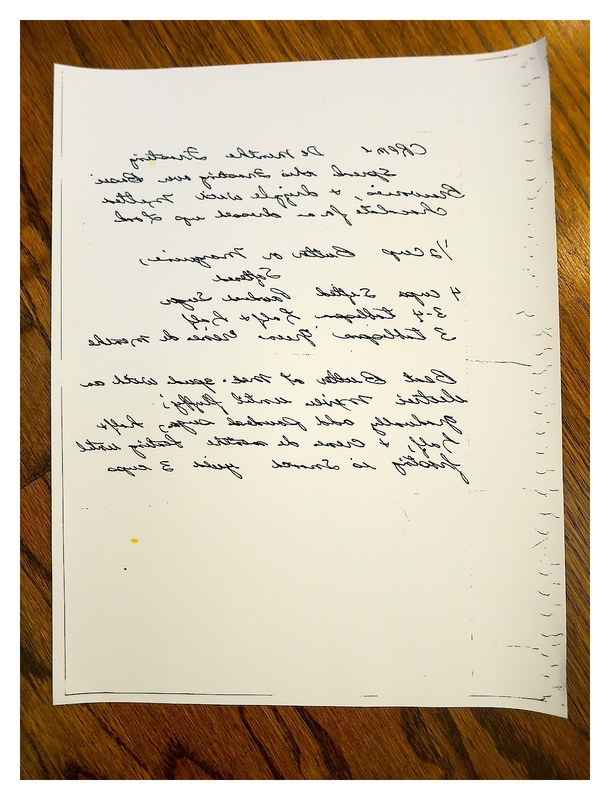 The handwriting is very easy to create and print. If you have some sewing skills, that’s an extra bonus because you can add trim to the bottom of your towel! We purchased these Heat-n-Bond sheets at our local craft store. 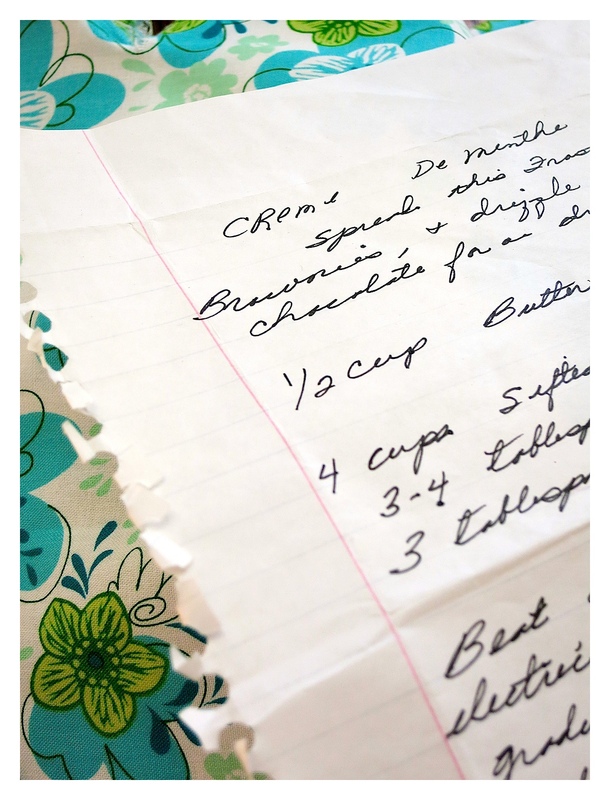 Depending on how large your recipe is, you can get multiple copies on one sheet. 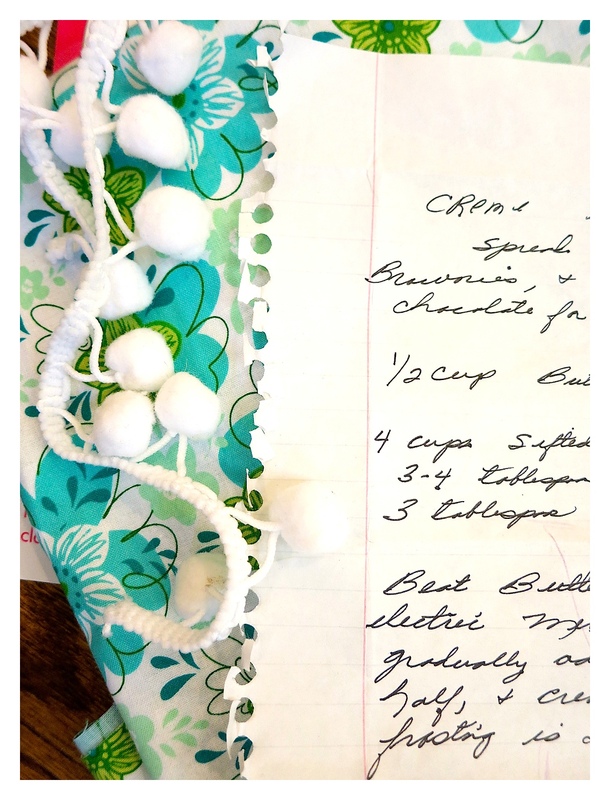 We gathered pretty fabric, white Pom Pom trim and of course the cherished recipe. These flour sacks were perfect for this project. Can you believe the price. We purchased a few of these sets at Tuesday Morning. 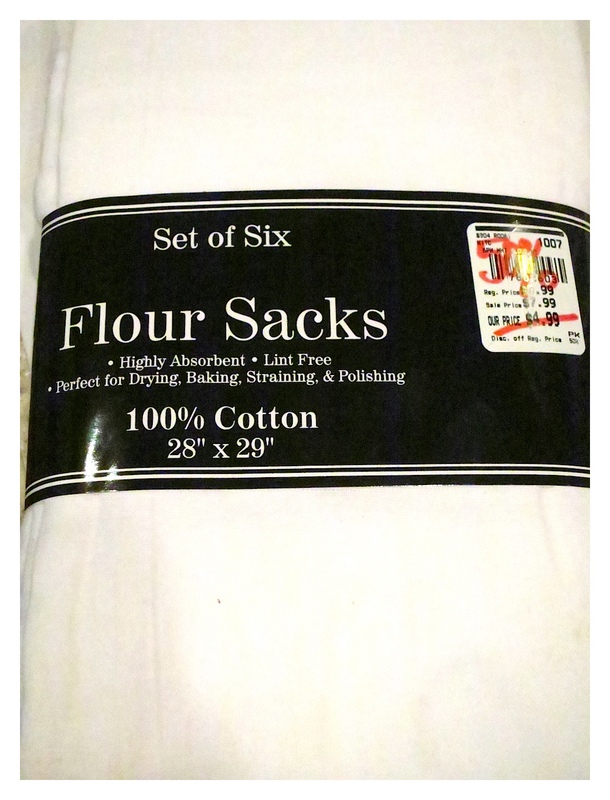 Basically each flour sack towel is about .41 cents – you just can’t beat that! Printed in mirror image – it might be called something else for your printer. Basically printing the wording backwards on your sheet. Now the fun begins! 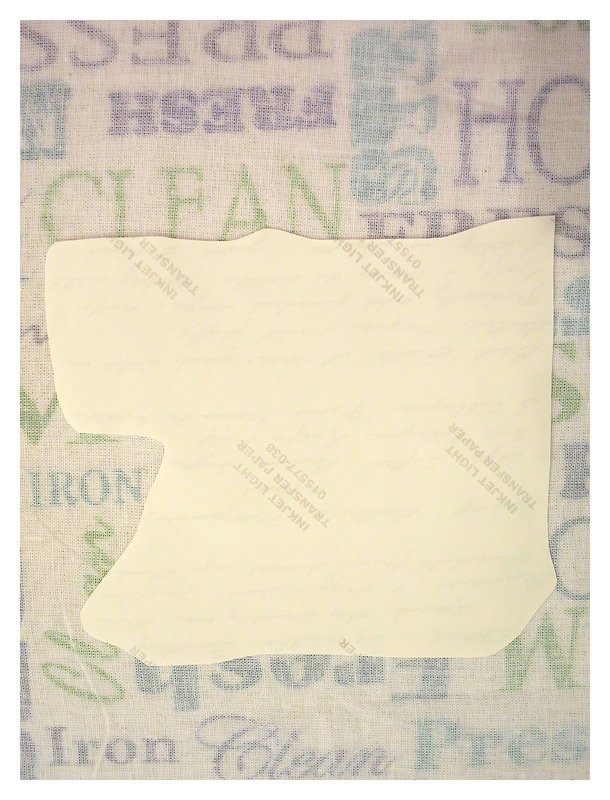 We ironed each flour sack and then guessed as to where we wanted the wording placement to be. We laid the printed sheet face-down on the towel. We then ironed the paper. It’s important that all water is removed from your iron so that there is no steam used. Make sure your iron is very hot and set on the “cotton” setting. 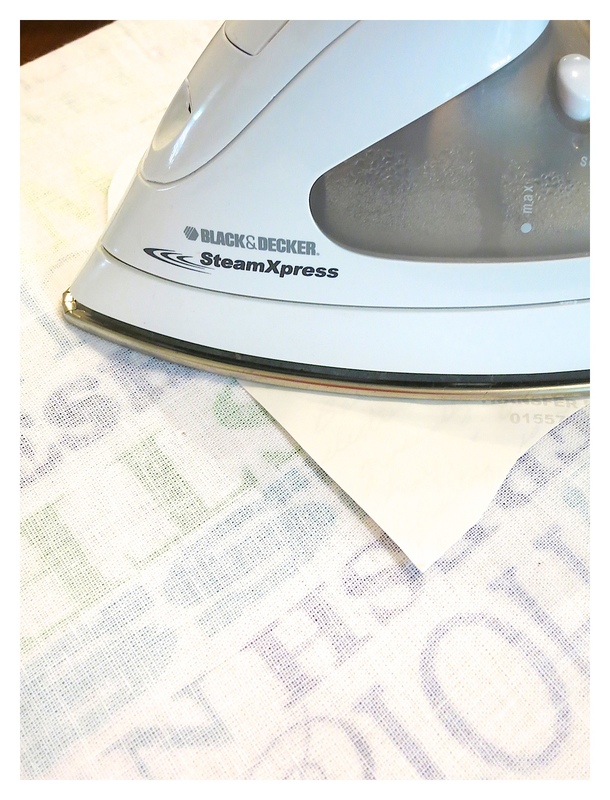 Begin ironing the paper into place – pressure is your friend. Press down the iron – don’t rub back and forth as this may smear your print. Just keep pressing the iron down on the paper for 30 seconds and then move on to the next section. Let the paper cool of about a minute. Begin lifting the paper backing and watch the magic happen! And here’s the towel after all of the backing is pulled off. Isn’t this great?! We were so excited! 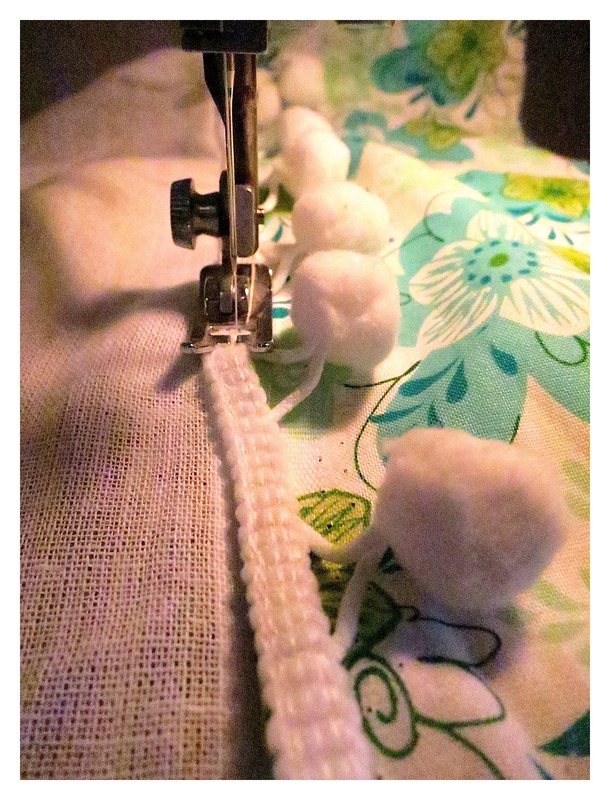 We sewed the fabric and Pom Pom trim in one easy straight line. We think these turned out great! This was such a fun day and time to celebrate my mom and Jennifer’s grandmother. We cherish our memories and her recipes so very much. Now, each time we look at our towels we will remember the fun day we spent crafting and cooking in the kitchen. Thanks so much for stopping by 🙂 We hope you give this craft a try. 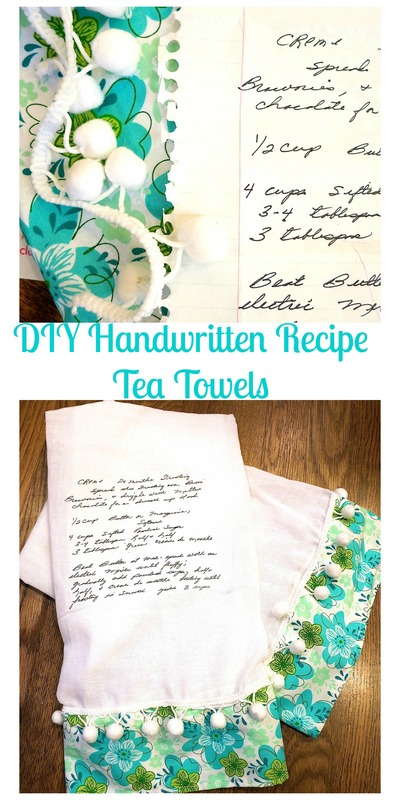 It’s a lot of fun and you can create your own memories by making your own DIY Handwritten Recipe Tea Towel! 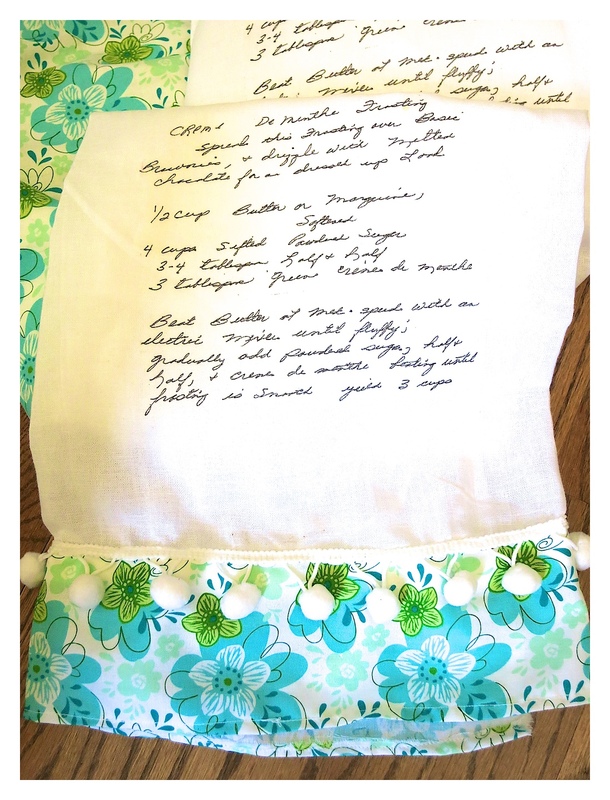 This is a great DIY and a wonderful to preserve a recipe for mom or grandmom. This seems like a very easy and versatile project for everyone. 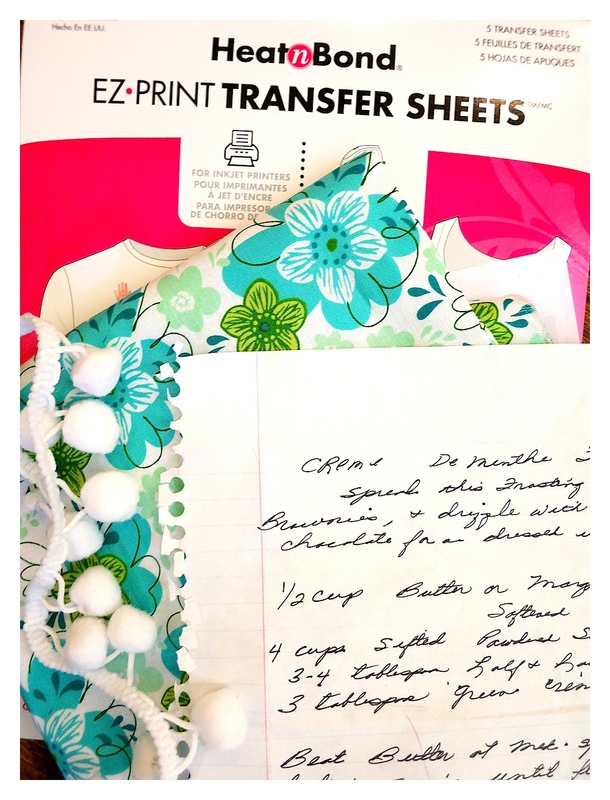 You ladies are so crafty…..love it! Thanks so much Tracy! It was a great way for the two of us to spend a day together and sharing our memories. This is such a great idea! I think you could do these for family gifts too! Thanks for sharing!! Hey Angie – thank you! We plan to make several of these for family members 🙂 We hope that you do too! I have something like this pinned on Pinterest, but I don’t think it included any directions. I absolutely LOVE this idea. What a great gift idea. Thanks for sharing! 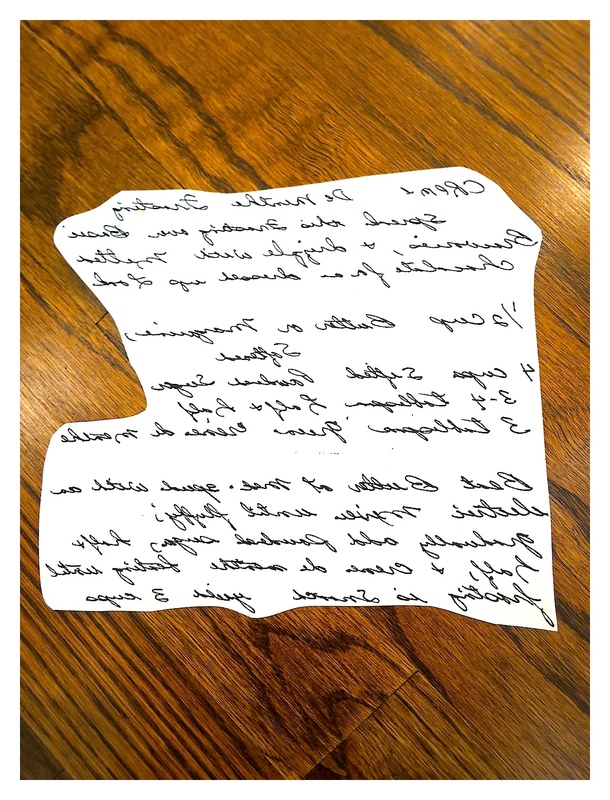 Erin @ the-organized-life recently posted…ORC Week 4: Our Most Productive & Disastrous Week! He Lisa – thanks so much! We hope to make a lot more of them as gifts! I absolutely love these ladies! I am sitting here thinking if I have anything handwritten from my grandma! I want to make some of these! She is 93 and I love her to pieces! Such a sweet idea… Hope you both have a fabulous weekend! You girls are killing me with your awesome projects. For reals, I am LOVING this. I would have never thought to put heat n bond on a flour sack towel. You guys are always thinking out of the box. These are going to make the sweetest gifts. Love love love! Thanks CoCo! As you know, this was a very special project for Jennifer and I. We were very happy with how the tea towels turned out – mom would have been tickled pink! Hey Bobbi – we love to create memorable gifts and this project was extra special to us! You are both so creative! I absolutely love this. I will have to do this with some of my grandma’s recipes! They will make perfect Christmas gifts this year! Hey Cat – thanks so much! We really loved this project. The tea towels are perfect as gifts. I think they would make great shower gifts too! Oh my gosh! I want one! These turned out so cute! My wheels are turning now for some quick DIY Mother’s Day gifts for my mother and grandmother. They would love these. I love this idea! I think a few of these using my grandmother’s recipes would be a great gift for my mom for Mother’s Day. Love this idea! Mother’s Day gift for sure! Question: are these washable? With the heat n bond, does it come out “plasticky” where the recipe is printed? How do they feel to wipe/dry your hands on them? And how have they held up over time? I love this idea! So sweet and sentimental! I’m curating a list of ideas for sentimental Christmas gifts for a blog post and would love to include something like this since it’s so easy to do and inexpensive to make – would you mind if I included a picture from this post and link back to it? That would be wonderful Mauri! Thanks for including us! Does this hold up in the wash? Hi Alli – Yes, with this method it does hold up in the wash. You need to be sure to read the directions on whichever transfer method that you choose. They should clearly state whether the graphics can or cannot be washed.